This was the 29th meeting of the Group, and the third to be held at the Trinity Centre in Wallington in south-west London and organised by Albert Greenfield. The meeting got off to a relaxed start, sitting down with coffee, tea and biscuits and catching up with old friends. After everyone had arrived, we moved into the hall for three entertaining talks before lunch. Unfortunately, it was not possible to video the talks this year. 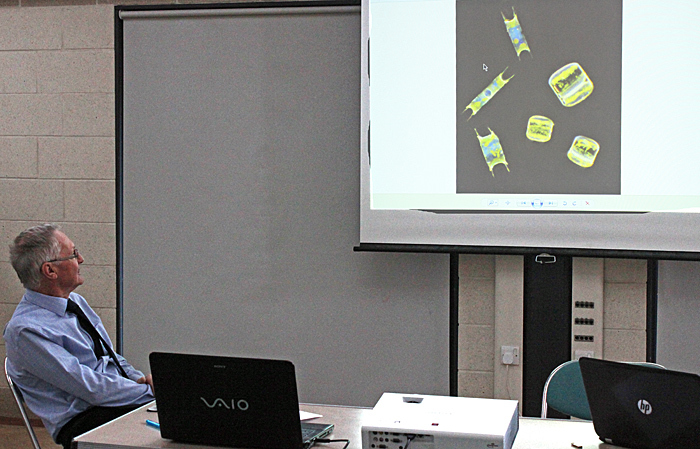 Phil Greaves spoke on “Cutner and the Coal Balls”, starting with a brief history of coal mining, the invention of steam engines, and the rapid growth of industrial towns in the UK. Coal balls are not made of coal, they are concretions found within coal, and unlike the actual coal they often contain good fossils of prehistoric plants. Most companies that sold prepared slides did not include slides of coal or coal balls, a notable exception being Flatters & Garnett. Coal balls are not common, and there is a lot of waste when preparing thin sections, so slides are uncommon. 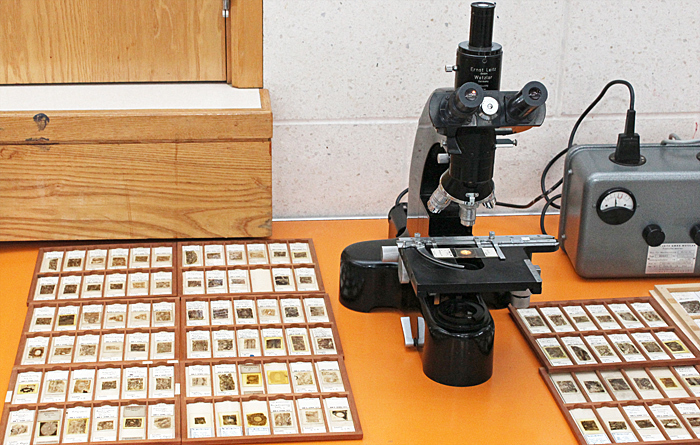 However, once a surface has been cut and polished it is not difficult to make an acetate peel of the fossilised material and mount it on a slide, and John Cutner made lots of these slides. The process involves etching the surface with hydrochloric acid to dissolve some of the minerals, washing away the acid, flooding the surface with acetone and applying cellulose acetate. 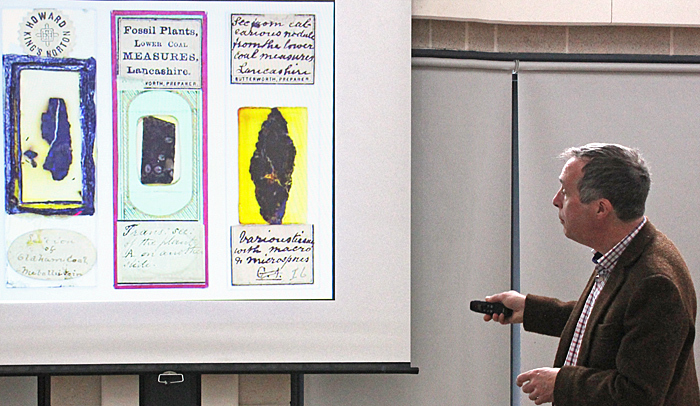 When dry, the cellulose acetate can be peeled off and mounted on a slide. There is a paper in the Journal on The Preparation of Cellulose Lacquer Rock Peels by K. W. Abinera. 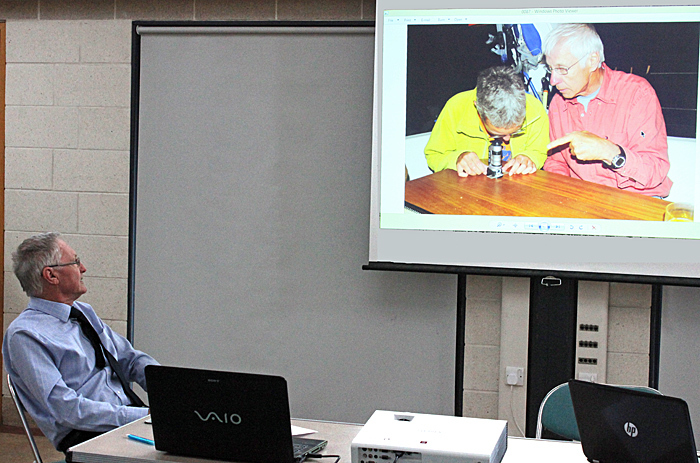 Nigel Williams showed lots of photographs to illustrate his talk “From Cetaceans to Copepods…all creatures great and small”. 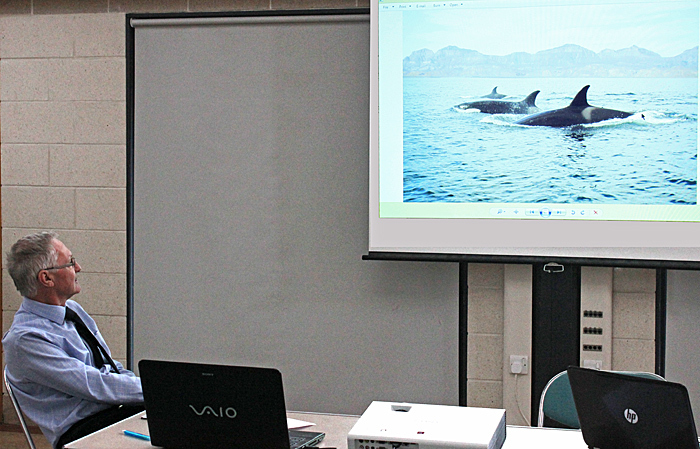 Nigel and Janet have been to several parts of the world to observe whales, and Nigel has some amazing photographs of whales and polar bears, and also photographs of flowers, mosses, lichens, butterflies and birds that they saw. 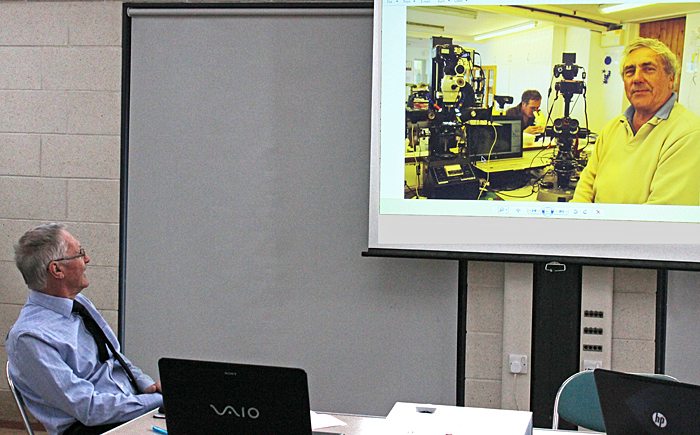 Nigel has also been on the marine microscopy weekend at Dale Fort in Wales, where members use some fascinating pieces of equipment such as a Zeiss Tessovar attached to a Bowens Illumitran. When he cannot take a full-size microscope, Nigel finds room for one of the popular Natural History Museum pocket microscopes. Joan Bingley went to the USA to observe the total eclipse of the sun on 21st August 2017. Her group stayed in Dubois in Wyoming and from a hill overlooking the town they had a good view of the event. Joan used 3 balls representing the sun, the moon and the earth to demonstrate the principle of the eclipse. 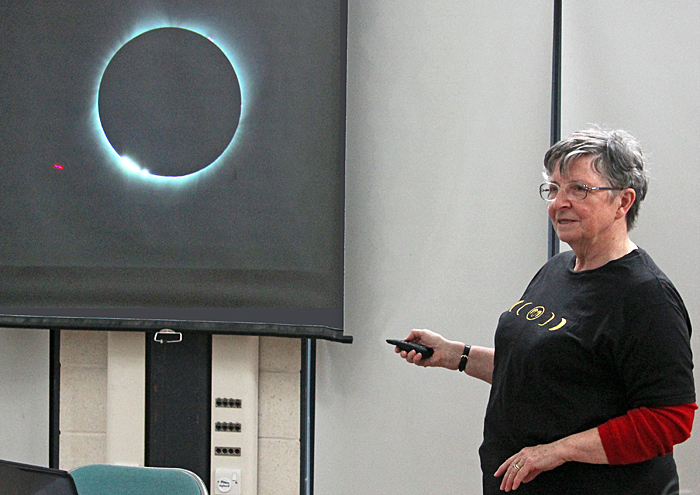 Joan’s presentation included photographs of various stages of the eclipse, including ones by people who used fancy equipment. 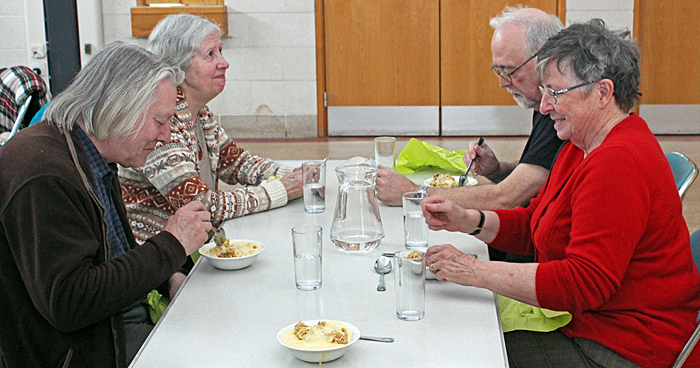 After the lectures, we all sat down for lunch, shepherds pie with broccoli, carrots and peas, followed by apple crumble with custard. After lunch, members set up their exhibits. 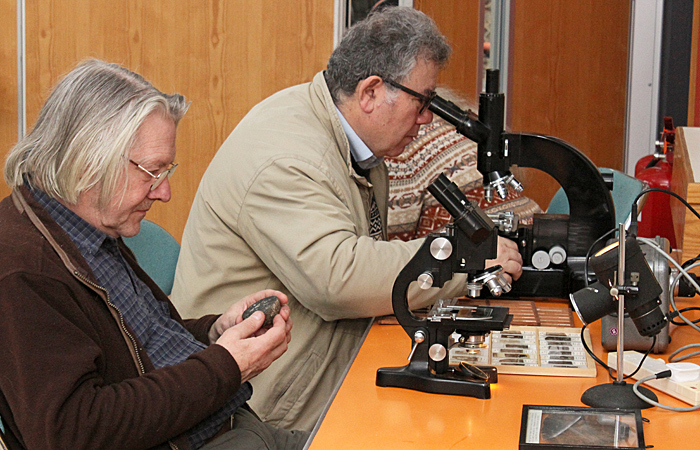 Phil Greaves set up a black Leitz Orthoplan and a smaller Leitz microscope so that we could examine his collection of acetate peel slides of coal balls made by John Cutner. 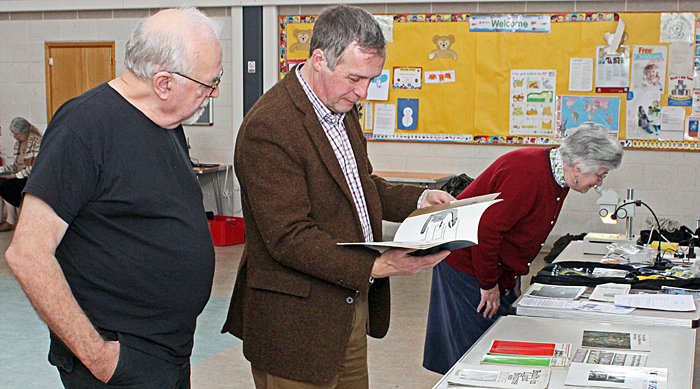 Phil also brought a real coal ball with a flat polished surface, a framed peel from a ball a few inches across, and some Flatters & Garnett slide catalogues that included sections and peels of coal balls. Joan Bingley brought her Carl Zeiss Jena GSZ stereomicroscope with its very heavy transmitted light base, hoping for some advice on removing the transformers and installing a much lighter circular LED plate. 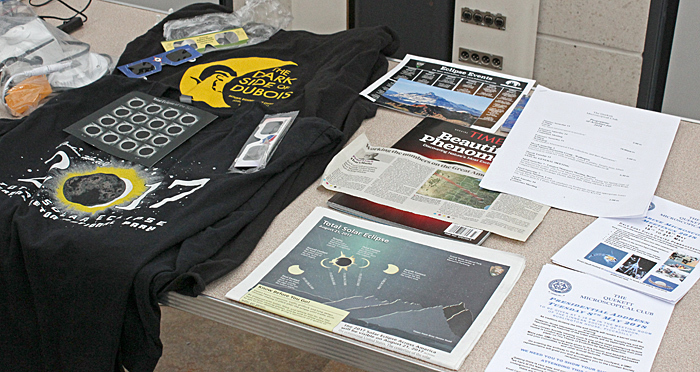 Joan also showed some eclipse souvenirs, including a T-shirt, a sheet of commemorative stamps and some protective glasses. She also brought some literature on eclipses and other phenomena. 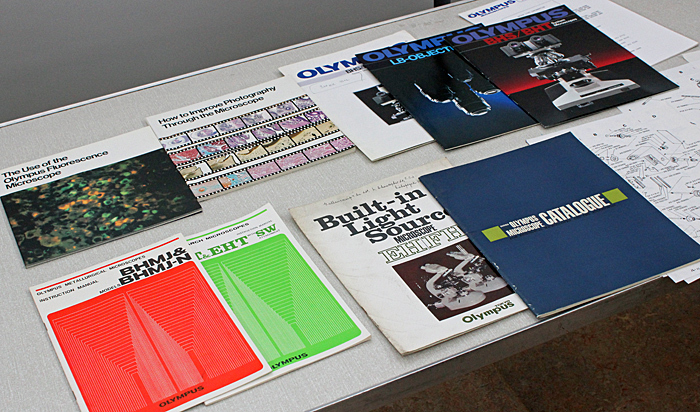 Alan Wood didn’t want to carry a microscope on the icy pavements, so he brought some of his collection of Olympus books, brochures, instruction books, exploded parts diagrams and repair manuals. Lots of these are available as PDFs on the Internet, including from Alan’s own page of Olympus microscope documentation, but it is nice to have the original printed versions. 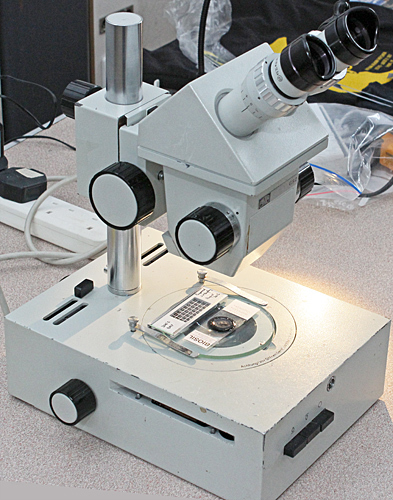 For Olympus and for other manufacturers, the Quekett website has a page of Links to download microscope instruction manuals, brochures and catalogues as PDFs. The meeting ended with another round of tea, coffee and biscuits.